The Museum Gardens, at the centre of York, are of major botanical, geological, archaeological and horticultural importance, as well as being very well used by York residents and visitors. The Yorkshire Philosophical Society originally created the Gardens in 1830, and continued to manage them until 1960 when they were ceded to the local authority. 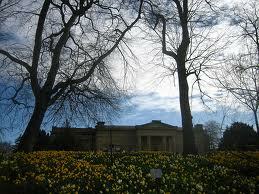 Since 2002 The York Museums Trust has owned and manages the Gardens. YPS retains a keen interest in the development of the Gardens and a small group of YPS members meet regularly in the Lodge to hear about the latest developments, and to discuss ways in which the Society can contribute to the ongoing development of the Gardens. In 2015, the YPS, collaborated with the YMT to mark the 200th anniverary of William Smith’s groundbreaking geological map,by installing a pebble mosaic representing the Yorkshire section of the map. We are now proposing to publish a history of the first two hundred years of the Gardens. Much research has already been done.The following information gives a short overview of the emerging story. Its impossible to summarise the history of the Manor Shore/ Museum Gardens in a few words. The pre-YPS history is important, ans it explains why the space was available for YPS to settle in. There are traces of Roman buildings (apart from the Multangular Tower) and a road running roughly between Lendal and Marygate entrances, thence to Clifton. Later the area was probably part of Earlborough, explaining the church dedicated to (Scandinavian) St Olave. The period of St Marys Abbey is quite well understood: much of the Abbey is still visible, and the monastic precinct defines the Museum Gardens to this day. At the Dissolution, St Marys Abbey and the Abbey precinct  thanks to Henry VIII, who stayed on the site in 1541  became Crown property. The Manor Shore fell on hard times. The Abbey ruins were quarried for building stone (to build a new Gaol, and repair Beverley Minster) and burnt for lime, and parts of the land were leased as a boatyard, a coalyard, a wood store, and for pasture. Intermittent moves were made to build a school, a prison, or an up-market Georgian square (with attached pleasure-garden): nothing came of these plans. The Manor Shore was popular for visitors admiring the romantic ruins, militia parades, the holding of pistol-shooting competitions, and the launching of balloons. Then in 1826 the Yorkshire Philosophical Society persuaded Lord Grantham to relinquish his lease of the Manor Shore, and the Government Office of Woods & Forests to lease to the Society the upper portion of the Manor Shore, to construct a Museum, and create a Scientific Garden. The area comprised roughly that between the back of Kings Manor and a line just beyond the Observatory. The lower Manor Shore, as far as the river, and most of the Abbey church and the area behind the Art Gallery, were acquired in later transactions in the 1840s and 1860s. Thus the Gardens, more or less as we know them, came into existence. The YPS Archives (and other archives) hold a wealth of detailed information about the Gardens throughout the 19th and 20th centuries. We know quite a lot about the design of the Gardens by Sir John Murray Naesmyth (but not how he came to be involved, or what he was paid  the Secretary forgot to fill in the amount in the Council Minutes!). We have patchy information about planting schemes, plants purchased and donated, pruning, lopping of trees, and the gardeners pay. Much of the 19th century was dominated by the sub-curator Henry Baines, who seems to have had a fondness for stove  hothouse  plants, and who was largely responsible for acquiring collection of orchids, and a giant Victoria regia waterlily, which was installed in its own building. Other sideshows in the Gardens, at various times, included a menagerie and aviaries. The Botanic Garden came to be restricted to a formally planted area near the Hospitium: most of the Museum Gardens became a pleasure garden for members of the Society. Subscribers held keys, and members could issue Admission Orders to friends: respectable members of the public were allowed in, at certain times, on payment of a small sum  or, on special occasions, free of charge. None of these restrictions, of course, prevented periodic occurrences of misbehaviour, usually by Boys. The nature of the misbehaviour is rarely specified  sometimes it involved balls and windows, or following around young ladies on improving school excursions, or releasing the lawn roller to run downhill. The Societys response to misbehaviour was, relatively, swift: Henry Baines reported it to the next Council meeting and, after due deliberation, A Letter was sent to the parents of the miscreants. In the case of improper behaviour in the Gardens after dark  not specified  the problem was addressed by the appointment of a Ranger. Judging by the number of repeat offenders, it is not obvious that either approach was efficacious. So the Gardens proceeded into the 20th century. More and more, the Society seems to have felt an obligation to allow use of the gardens for the public good, whether by allowing admission to Horticultural Shows, band concerts, railway excursionists; or, during the First World War for patriotic events or offering the ground for quartering troops or horses. Meanwhile, the City Corporation made sporadic attempts to acquire the Gardens as a public park; starting with a suggestion to the Society that they might like to celebrate Queen Victorias Jubilee in 1897 by handing the entire Garden over to the City. 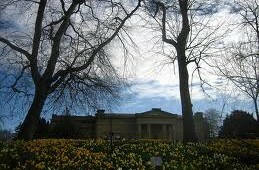 In the end, YPS had little option, and in 1961 both Gardens and Museum came under the control of the City of York Council. When the History of the Museum Gardens eventually appears  buy it! In the mean time, if you know of any sources of information about the Gardens that we might have overlooked, please tell us, and if you have any personal reminiscences of the Museum Gardens, particularly before their acquisition by the City Council, wed love to hear from you! For more information on the Gardens group click here to see the YPS Gardens Group page.